This is the eighth in a series of short critical looks at books of literary criticism. Yes, a writer writing about writers who write about writers! I composed these for a private Facebook group originated by my friend Sara Mortimer Boyd, called the “Literary Criticism/Critical Theory Reading Group.” Members suggested a number of books about writing, and read them and reacted to them. I will publish mine here, once or twice a month, in the order in which I wrote them–an order voted on by the group. I did not read this book for this critique. I didn’t have to. 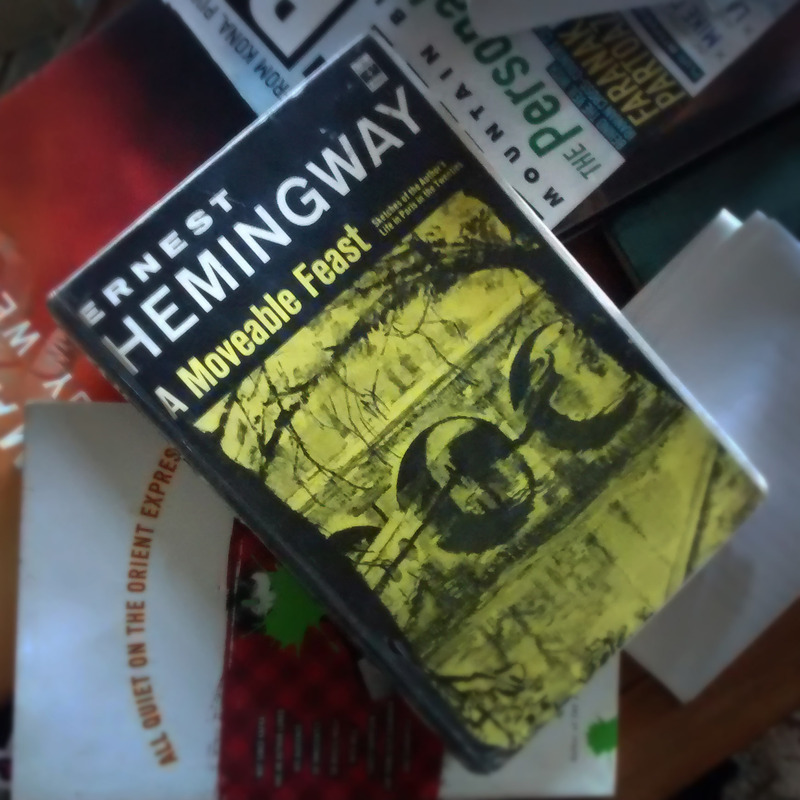 I’ve read Hemingway’s A Moveable Feast at least ten times, probably more. There’s always been a copy somewhere anywhere I’ve lived, since I first encountered it ages ago. I re-read it frequently–at least twice a year. These days, it sits on our book table in the living room, and I often pick it up, open it at random, and read a bit. While it doesn’t have the focused poetic brilliance of Hemingway’s best short stories, it is probably his most humane work. His love for Hadley Richardson glows throughout, especially when he confesses his regrets for throwing it away, in the final chapters. His love for Paris, in “the early days when we were very poor and very happy,” the best place to write in, he says, that ever was, his love for Paris fills the book with a soft revealing light as well. I myself have lived in Paris, and though what I wrote there was no good, writing there was good, in the tiny extra room of my cousin’s apartment, opposite the cemetery in Montmartre. But that’s another story…. While the book is truly a memoir of Paris between the wars, it is also perhaps the only place where Hemingway writes willingly about the craft of writing. He writes of his own work, and of that of other writers he knew during that time. Paris–inexpensive then–attracted plenty of well-known English-language authors, and Hemingway talks about James Joyce, Ezra Pound, F. Scott Fitzgerald, Gertrude Stein, and others whose company he kept when he lived there, people who advised him, and that he advised in turn, people who were his friends as well as his colleagues. The little book’s pages are rich with casual critical analyses, not always praiseful–Stein’s refusal to rewrite her work dismays him, and Fitzgerald’s practice of writing the “real” short story and then tweaking it to make it commercially appealing to magazines nearly infuriates Hemingway–but Hemingway is pretty modest about his own craft. He talks about how hard it was to invent the now-famous “Hemingway style,” and how perhaps overdoing the understatement led him to where, he says, speaking of his potential audience, he had “gotten them to the point where they didn’t understand them” at all. Sales were rare for him in those days, and money tight, and his aesthetic principles merciless. He also talks of the practice of writing: how a quiet room and little rituals helped him work; how skipping out on social pleasures was important if they were the sort of pleasures that would interfere with the work (as they interfered with Fitzgerald’s); how it was important always to stop working before you had expended all your conceptions, so you would have someplace to start from the next day. There are several passages about the dangers of praise to a writer, and how he succumbed to it himself, and the things it ruined. There’s nothing about what your style should be; plenty about how to achieve your style. Plenty about the relationships writing fiction has with the culture around you and the commercial mechanisms that connect writing with that culture, which writing itself in part creates. I loved this book before I visited Paris; I loved this book before I started writing seriously. And because of this book, I was able to love Paris more; because of it I have been able to write better, more truly, more humanely. A Moveable Feast is the last piece of writing that Hemingway finished before his suicide in 1961. It was first published after his death. He can’t have wished for a more brilliant valedictory.